Click to play Sacred Ground video. Archaeological encounters with human remains bring into sharp relief the competing values surrounding cultural heritage. It doesn’t always go well – powerful emotions are uncovered alongside the burials. So it’s refreshing and informative to come across a short video, Sacred Ground: In honour and in memory of our ancestors, made by Crossroads Cultural Resource Management, which follows the aftermath of the accidental disturbance of human remains at Hagwilget, on the Skeena Bulkley River. Human remains hastily reburied in drain tile. Screenshot from Vimeo. The disturbance, some five years earlier, had understandably left a bad feeling in the community. 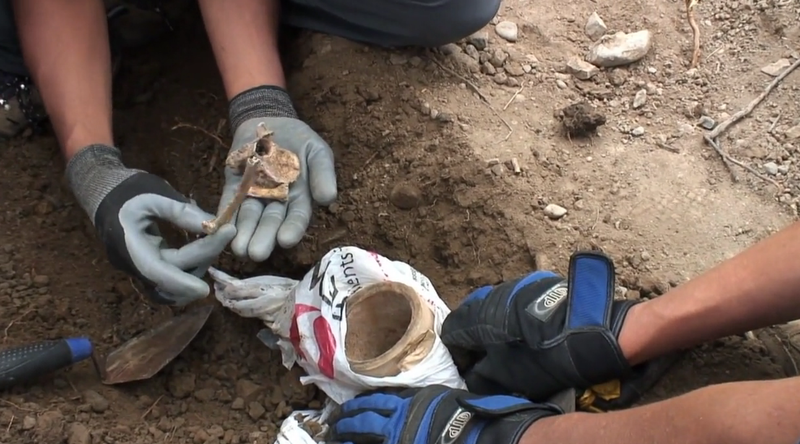 In the video you can see that human remains were hastily, carelessly reburied in plastic bags or, in one case, in a drain tile. Clearly something went terribly wrong during the Hydro pole renewal project. Cross found at the disturbed burial site. Screenshot from Vimeo. Crossroads was engaged to recover any residual human remains from the disturbed site for reburial. 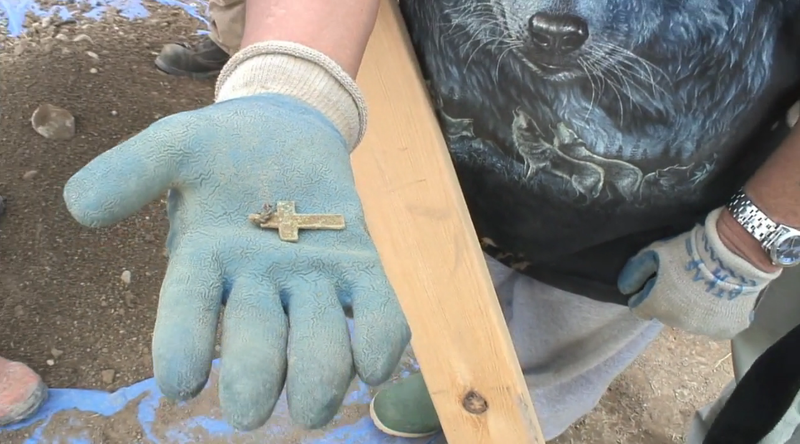 It’s clearly a very recent burial site as cloth remnants, nails, and a cross were discovered. Some bones are articulated and in one case appear to be still bound by ligaments. Another, undisturbed burial still in a coffin was also encountered. In the course of this they worked closely with the community, and their video includes the voices and perspectives of numerous people from Hagwilget. 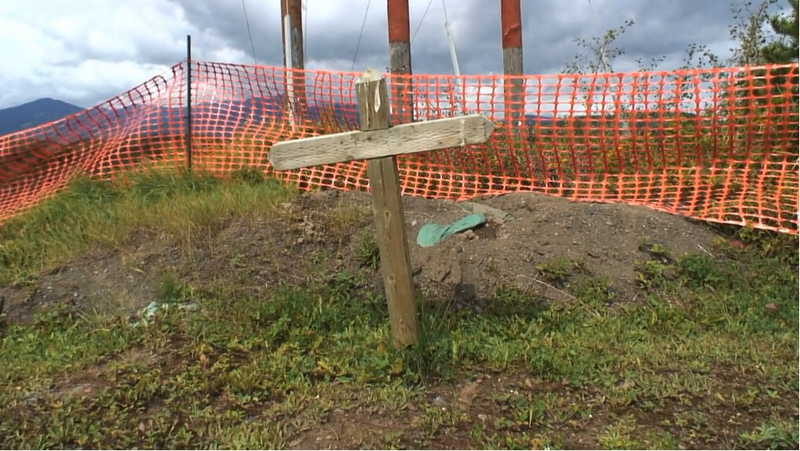 On Aug. 15, 2011, when we stepped onto the site in Hagwilget where BC Hydro had accidentally disturbed a centuries-old burial ground and unleashed years of upheaval for the community five years earlier, the Crossroads team didn’t know what we’d find. We knew that it would be sensitive and we knew that it would be profound. We knew that we needed to document the story as it unfolded. The community’s voice, and the turbulence it had experienced, needed to be shared so this situation would never happen again. In an unexpected but welcome twist, BC Hydro personnel showed up to both apologize for their transgression, and to take a workshop in cross-cultural and archaeological awareness. Certainly not all disputes end as well as this one seems to have; it’s to the credit of all concerned, including Crossroads principal Rick Budwha and camera operator Amanda Follett, that the event turned into a learning and teaching moment for the community, for BC Hydro, and for Crossroads themselves. In that spirit, it’s the kind of video which, in length and content, I can easily imagine being shown in Archaeology classes where it would form a solid base for class discussion. Cross at disturbed burial site, Hagwilget. Screenshot from Vimeo. This entry was posted in anthropology, Archaeology, Cultural Resource Management, fieldwork, First Nations, Northwest Interior and tagged alaska, Bulkley River, burial, cemeteries, CRM, Cultural Resource Management, Gitxsan, Hagwilget, human remains, reburial, Skeena River, Wet'suwet'en. Bookmark the permalink. An impressive outcome for all involved, considering the origin of the disturbed graves. Great blog here as well, keep it up!